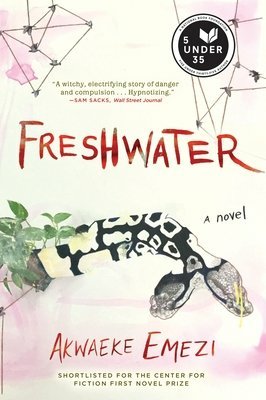 ...[a] remarkable and daring debut novel... Freshwater is a poetic and disturbing depiction of mental illness as it haunts the protagonist from birth to adulthood... Unlike many depictions of dissociative identity disorder in fiction, Emezi steers clears of hysteria and fear-driven drama.... More powerful than Emezi's prose, though, is what it brings to the real world. Eating disorders, cutting, depression, suicide, manic depression  in the popular imagination, all these things are most often seen as the struggles of young, wealthy, white American women. This novel expands the universe of mental illness to include women of color and other ethnicities.... Freshwater builds slowly, but that only crystallizes how fractured Ada and her personalities are. As the voices in her head get louder and grow hungrier, the story gains momentum. The novel is based in many of the realities of the writer's life, but the prose is infused with imaginative lyricism and tone. In the end, this coming-of-age novel also has one foot on the other side, held between the open gates � a young woman of many nations and many souls.... Emezi's lyrical writing, her alliterative and symmetrical prose, explores the deep questions of otherness, of a single heart and soul hovering between, the gates open, fighting for peace. Akwaeke Emezi's bewitching and heart-rending Freshwater is a coming-of-age novel like no other.... It isn't crucial to one's appreciation of this novel to know that it's author describes it as somewhat autobiographical, but that fact combined with Emezi's entrancing descriptive skill helps explain the disarming conviction of her telling. For all its sheer invention, Freshwater feels more like an interpretive journey through uncharted territory with an experienced guide. Potent and moving, knowing and strange, this is a powerful and irresistibly unsettling debut. ...a slim novel so rooted in its lineage and yet so bright, putting thoughts together in new ways, crafting a devastating and exuberant work.... This is Emezi's story, shot through with fiction. Truth and reimagining flow into and through each other here. She has woven them into a story to share with us, and it feels like a blessing. The book explores mental health, metaphysics, faith, and inter- and intra-personal relationships in glorious, astonishing and brutal ways. This is a paean to the self, to the selves. FRESHWATER is simply, and unquestionably, an absolute masterpiece of a novel. ...a narrative richly steeped in Igbo folklore, though readers may be reminded of the more familiar Greek epics, in which the gods treat their human playthings with affection or spite but above all with majestic indifference.... Its conclusion is as striking and mysterious as the ways of the gods who narrate it.... Ms. Emezi's debut is the latest standout in this exciting boom in the Nigerian novel.